Trade union Mandate has strongly rejected the claims. 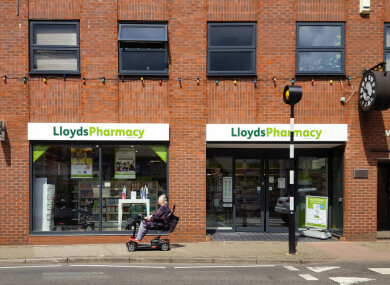 LLOYDS PHARMACY HAS accused Mandate of “putting the lives of patients at risk” by serving notice of another strike – a claim that the trade union has strongly rejected. The pharmacy chain said that it has been made aware of an industrial action at the Dublin headquarters it shares with United Drug, the company owned by Lloyds parent the McKeeson group. Mandate members have several strikes during the summer and earlier this month picketed over 30 stores. The company said that a strike at United Drug, a medicine distributor and wholesaler, “has the potential to disrupt the delivery of medicine to pharmacies throughout Ireland”. “The lives of vulnerable patients as well as the operation of many businesses completely unconnected to this issue are being threatened by Mandate’s action,” said Pat Watt, director of sales and marketing at Lloyds Pharmacy. In response to those claims, Mandate spokesman David Gibney told Fora: “We absolutely refute any allegations from the company that our members or Mandate has behaved in a reckless fashion. “We have at no point put lives at risk. We have behaved in the most responsible manner,” he said, adding that Mandate and its members have not forcefully prevented people from passing their picket lines. Gibney said that if Lloyds Pharmacy is serious about the concerns of the public and its workers, it should meet with the union, which has been recommended by the Labour Court and endorsed by Minister for Business Heather Humphreys. “The entire country has explained to Lloyds how to avoid this dispute,” Gibney said. Following a meeting at Citywest this week, Mandate members voted 75% in favour of temporarily suspending further industrial action. Through a statement, workers said the company’s refusal to engage with the union has “inconvenienced the public”. Lloyds Pharmacy, which employs more than 1,000 people at 90 Irish stores, doesn’t recognise Mandate as representing workers and told the Labour Court that it deals with issues around employment terms and conditions through an internal ‘colleague representative committee’. It has rejected claims that it employs people on zero-hour contracts. The company recently announced that it agreed on a new deal with staff which delivers pay increases, additional benefits, the implementation of banded working hours and a voluntary severance package. Lloyds Pharmacy is also holding ‘employee engagement evenings’ in Dublin and Limerick following an event that took place in Cork. Email “Lloyds Pharmacy has accused striking workers of 'putting the lives of patients at risk'”. Feedback on “Lloyds Pharmacy has accused striking workers of 'putting the lives of patients at risk'”.